14. Do (epi)-genetics impact the brain in functional neurologic disorders? Functional Neurologic Disorders, the latest volume in the Handbook of Clinical Neurology series, summarizes state-of-the-art research findings and clinical practice on this class of disorders at the interface between neurology and psychiatry. 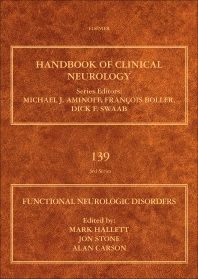 This 51-chapter volume offers an historical introduction, chapters on epidemiology and pathophysiolology, a large section on the clinical features of different type of functional neurologic symptoms and disorders (including functional movement disorders, non-epileptic seizures, dizziness, vision, hearing, speech and cognitive symptoms), and then concluding with approaches to therapy. This group of internationally acclaimed experts in neurology, psychiatry, and neuroscience represent a broad spectrum of areas of expertise, chosen for their ability to write clearly and concisely with an eye toward a clinical audience. This HCN volume sets a new landmark standard for a comprehensive, multi-authored work dealing with functional neurologic disorders (also described as psychogenic, dissociative or conversion disorders). Dr. Hallett is the President of the International Federation of Clinical Neurophysiology. He also serves as the Chief of the Human Motor Control Section, National Institute of Neurological Disorders and Stroke, National Institutes of Health, Bethesda, Maryland. Dr. Hallett obtained his M.D. at Harvard University, interned at the Peter Bent Brigham Hospital and trained in Neurology at Massachusetts General Hospital. He had fellowships in Neurophysiology at the National Institutes of Health and at the Institute of Psychiatry in London. From 1976 to 1984, Dr. Hallett was the Chief of the Clinical Neurophysiology Laboratory at the Brigham and Women's Hospital and worked up to Associate Professor of Neurology at Harvard Medical School. From 1984, he has been at the National Institute of Neurological Disorders and Stroke where he also served as Clinical Director of NINDS until July 2000. He is past President of the American Association of Neuromuscular and Electrodiagnostic Medicine and the International Parkinson and Movement Disorder Society and also served as Vice-President of the American Academy of Neurology. He has served as Editor of many journals and books and has had many honors. His work mainly deals with principles of motor control and the pathophysiology of movement disorders. Dr. Hallett’s interests in motor control are wide-ranging, and include brain plasticity and its relevance to neurological disorders and the pathophysiology of dystonia, parkinsonism, and myoclonus. In recent years, he has become interested in disorders of volition, including tic and functional movement disorders. Dr. Jon Stone FRCP PhD is a Consultant Neurologist and Honorary Reader in Neurology in Edinburgh. He has had a research interest in functional disorders in neurology since 1999 and completed his PhD thesis on a case control study of patients with functional limb weakness. He has published widely in the area including systematic reviews, large cohort studies, imaging studies and treatment studies. He has contributed to new diagnostic criteria for DSM-5 and ICD-11 and the development of professional organisations in this area. In 2009 he made a website for patients with functional neurological disorders at www.neurosymptoms.org which has been translated by other neurologists in to 12 other languages and receives 60,000 visits a month. As of August 2012 is a National Research Strategy (NHS Scotland) Career Fellow. His work has been recognised with plenary sessions at the World Congress of Neurology, American Academy of Neurology, Movement Disorders World Congress and Association of British Neurologists as well as the Jean Hunter Award for Nervous Diseases (Royal College of Physicians). Alan John Carson, MBCHB, MPHIL, MD, FRCPSYCH, FRCP is Consultant Neuropsychiatrist in Edinburgh, U.K. His interest in neuropsychiatry began during a spell working in Kenya, as a Wellcome Research Registrar, conducting a study on the psychiatric and cognitive effects of HIV infection. He then completed his higher training in Edinburgh, under the guidance of Professors Michael Sharpe and Charles Warlow, where he developed an interest in functional neurological symptoms. Dr. Carson currently works as a Consultant Neuropsychiatrist in Edinburgh, split between the brain injury units at the Astley Ainslie Hospital and the Regional Neurosciences Unit at the Western General Hospital, where along with Dr. Jon Stone, he is engaged in a series of studies on functional neurological symptoms. He has led a number of epidemiological studies on functional disorders, most notably the Scottish Neurological Symptoms Study. He has a particular interest in development of treatment strategies for functional disorders and has led development of novel brief psychotherapies for functional symptoms, and is one of the lead investigators for the CODES trial of CBT for dissociative seizures. Dr. Carson holds a number of advisory posts in neuropsychiatry and he is the chair of the National MCN for acquired brain injury. He is the associate editor of Journal of Neurology, Neurosurgery and Psychiatry and the President of the British Neuropsychiatry Association.